Entering the day behind by one-half point, the win nearly gave Zatonskih sole possession of the lead, as tournament leader IM Irina Krush got all she could handle from IM Rusudan Goletiani. In an atypical affair where Krush's king voluntarily moved to f1 and Goletiani's knights occupied f8 and h8, both players thought they were better. “Once the knights come out, my advantage is not permanent,” Krush said. Krush was caught off guard by the sacrifice 35...Nxf3. Afterward, she expected the immediate material equalization 36...e4, but instead the initiative-minded Goletiani preferred to step up the pressure by making a battery on the f-file. Krush survived the onslaught largely by ignoring it. Her counterattack was just enough to force a repetition of position. The story repeated in the U.S. Championship, where tournament front-runner GM Hikaru Nakamura tried everything he could but could only draw against GM Yury Shulman. This allowed defending champion GM Gata Kamsky to catch up, as he was able to overcome the blockade of GM Alex Stripunsky. Nakamura and Shulman played the longest game of the tournament. After five and a half hours and 101 moves, they were down to just their kings. After fruitlessly trying for more than 60 moves to win with an extra kingside pawn, Nakamura looked across the room for much of the final moves, seemingly chastising himself for missed opportunities. Shulman guessed that he was unhappy the minor pieces were allowed to be traded after 77...Be6+. Thanks to the zwischenzug 78...Re5+, Shulman entered an easily drawing rook-and-pawn endgame. Still, he insisted that the ending is drawn even without the “petite combinaison.” Nakamura has still never defeated Shulman in a tournament game. 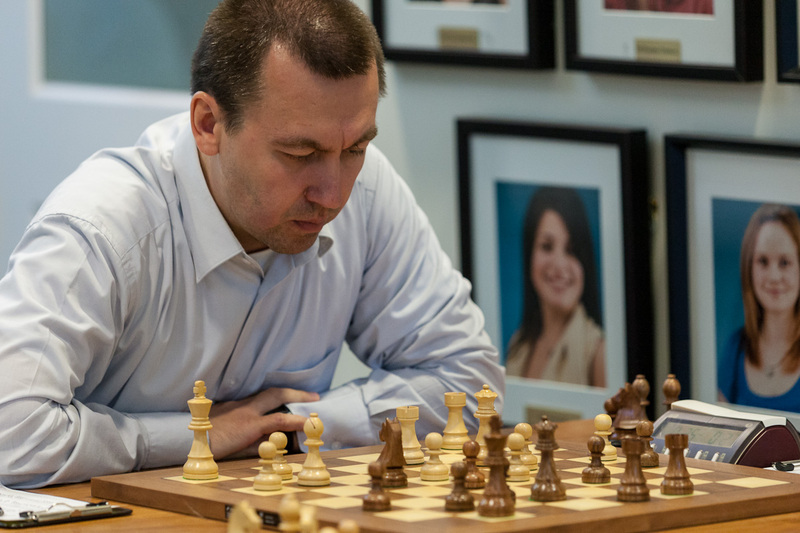 Stripunsky and Kamsky had drawn many previous games, but today Kamsky won for the first time ever in classical chess, though he had won a rapid game in 2006. After a lot of circular movement, Kamsky made the time control and got his c- and d-pawns moving. In the final position, he had promoted a second queen, with one more on the way. With both kings in danger, the underdeveloped Kaidanov found the subtle defense of retreating his one developed piece on move 32. “...Rg8! Wow! That was quite a move,” Ramirez said. The point was that the rook on a8 cannot be captured due to 33...Qe3+ 34. Kh1 (34. Rf2 Rf8) 34...Qg3 35. Rg1 (35. Bh3 Rxa8) 35...Qxh4#. In all variations, the wandering white queen is suddenly out of bounds. But after the time scramble resourcefulness, Kaidanov placed his king on the light square e4 and fell victim to an advancing a-pawn. Scrambling to get his rook back again, this time he was met with a skewer on the long diagonal. Ramirez was shocked at the turn of events, which saw him go from groveling for a draw to simply winning. After starting with two wins and two draws and sharing the early lead, Kaidanov has lost his last three. GM Varuzhan Akobian again jettisoned his favorite French Defense but used the Caro-Kann to eventually win a knight-and-pawn ending against GM Robert Hess. In other women's games, WGM Tatev Abrahamyan bravely walked her king up the board in beating WGM Sabina Foisor. WIM Viktorija Ni got back to an even score by using her extra rook to eventually overpower WFM Alena Kats's bishop. Round eight for the U.S. Championship and round seven for the U.S. Women's Championship will begin tomorrow at 1 p.m. Central, 2 p.m. Eastern. Come visit the Chess Club and Scholastic Center of Saint Louis or tune in to www.uschesschamps.org for live commentary from WGM Jennifer Shahade and the club's GM-in-Residence Ben Finegold.